Excellent location between Stone Crest and Blakeney Shops and Restaurants. Rare opportunity to live in one of the few 3 bedrooms, 2 full baths, 2 car garage. 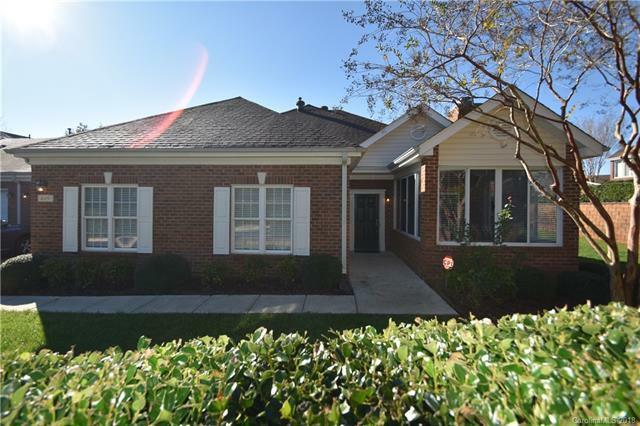 Full brick transitional home in Windsor Oaks with single floor living at an affordable price. Recent updates include new roof in 2017, newer carpet and wood laminate floors. Just painted throughout, upgraded lighting, refinished floors in sun-room, and garage and so much more. Large master bedroom with tray ceilings and walk in closet. Dramatic open floor plan, vaulted great room with fireplace (gas logs), opens to charming glassed in sun room. Formal dining room, large kitchen with breakfast area and computer niche with cable and internet connections. Active community with clubhouse, pool, library and fitness center. The 3 bedroom has french doors with wood floors, would make a great study or work out room. Picture perfect home with every thing you could every want and more ,just move right in and enjoy your new home.